L-arabinose is a naturally occurring isomer and is a component of plant polysaccharides. Most bacteria contain an inducible arabinose operon that encodes a series of enzymes and transporters, allowing L-arabinose to be used as the sole source of carbon in microbial cultures. 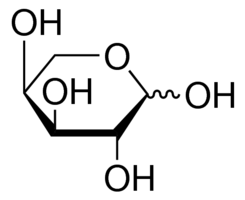 L-arabinose is a commonly used food additive and can also be used in medicine and as a medium.